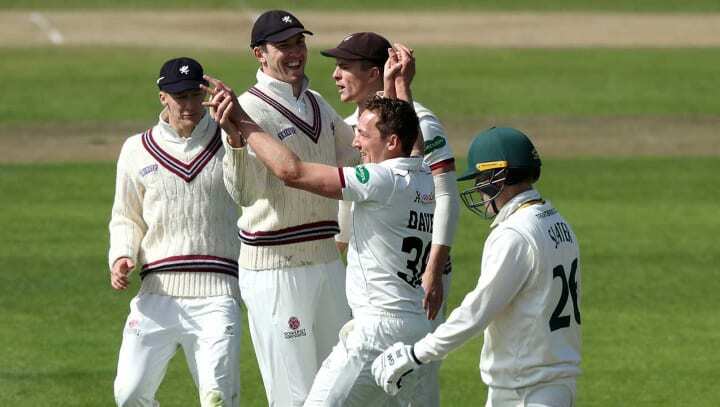 Nottinghamshire were handed a heavy defeat by Somerset in the Specsavers County Championship at Trent Bridge. Jack Leach recorded figures of six for 36 as Notts were bowled out for only 126 in their innings, giving the West Country side victory by an innings and 14 runs and giving them their second win in as many games. Davies claimed his second stumping of the day, soon after lunch, with Steven Mullaney dragged forward by the spinner, who then had Tom Moores sharply taken at short leg by Marcus Trescothick. The victory earned Somerset maximum points to become early pace-setters in Division One. Their next opponents in the County Championship are defending champions Surrey in a month’s time. Nottinghamshire will resume their First Class campaign at Chelmsford when they take on Essex after the break for the Royal London One-Day Cup matches.